This is the time of year that becomes difficult to cook. You muster your strength to again survive the harsh cold of winter (this one being especially challenging), knowing that spring is just a few short weeks away. But wait. March 20 doesn’t instantly bring a new season of fresh produce. Plants are still seedlings, barely yet being transported from greenhouse to ground. It’ll be another month at least before we see the first stalks of asparagus make their way to the Greenmarkets and still longer for those first stalks of rhubarb and ripe strawberries. I prepare well for the winter, canning and freezing whatever produce I can throughout the summer and fall months. Remember the weekend-long Tomato Wars? I’m lucky to have strawberry rhubarb jam or balsamic cherry preserves to slather on my toast, butternut squash to stir into my favorite mac & cheese and salsa to savor with chips. But around this time of year it all comes to an end. Last weekend I used my last bag of frozen corn. Heartbreaking as it was, I was determined to create something amazing to let the last of my summer bounty sing. 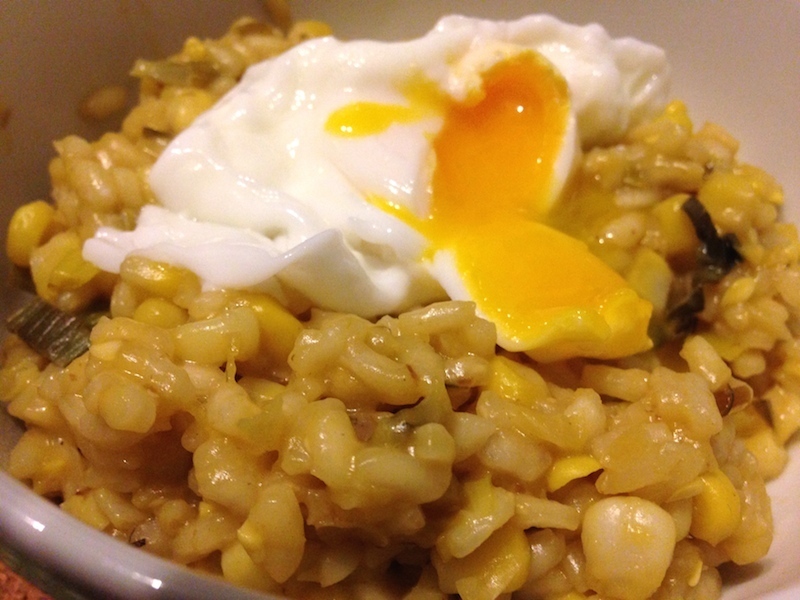 Risotto has always been a favorite of mine. After many trials, I learned its ease comes from patience and attention. 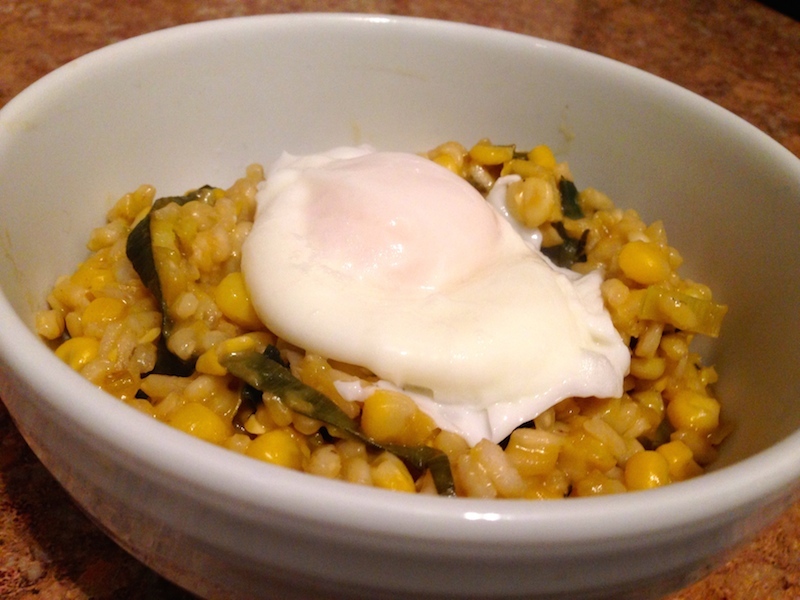 Saute the veggies, toast the rice, stir in the liquid until it becomes dense and creamy. I paired my corn with leeks to replace the need for onions plus add a bit of greenery to the pale yellow blend. While I’m usually quite content with my all veggie dishes, the sweetness of the corn was strong and the meal seemed in complete. The stay vegetarian, I opted for a poached egg, breaking the yolk and letting its richness coat the dish. On the other hand, if you’re in the mood for a meat fix, try adding a bit of crispy pancetta to the dish before serving. In a large saucepan, bring broth to a boil. Reduce heat and simmer, to be added gradually to risotto. Heat oil in heavy large saucepan or dutch oven over medium heat. Add leeks and cook until soft and slightly browned, stirring occasionally. Add rice to pan and toast for 1 minute stirring constantly. Add wine; stir until absorbed, about 2 minutes. 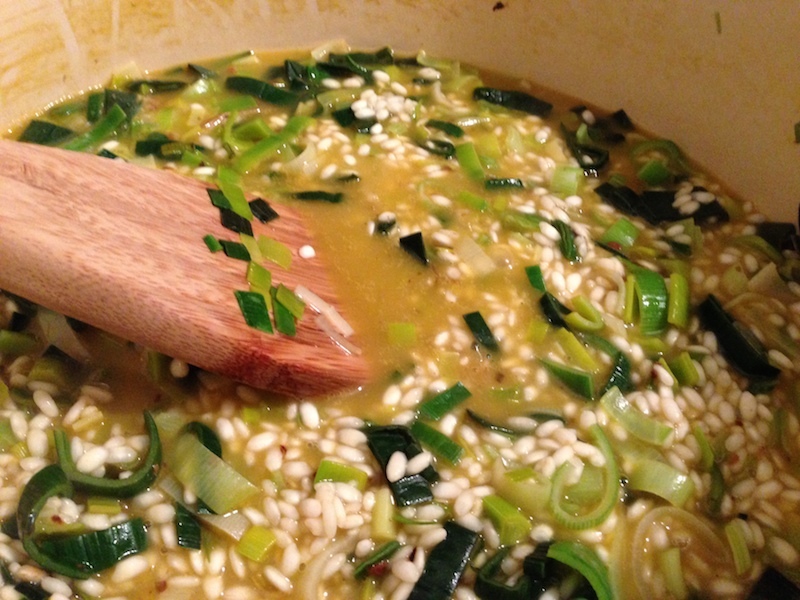 Ladle warm broth into pan, just enough to cover risotto; stir until broth is absorbed. Repeat adding broth and stirring until rice is tender but still firm to bite and sauce is creamy, stirring frequently, about 20 minutes. Add corn, cheese, salt and pepper to taste. It is sad right using the last of what was preserved. I know it will be April and May even June before we start to see the great produce and I can’t wait, Love the risotto, it looks perfectly creamy and delicious!